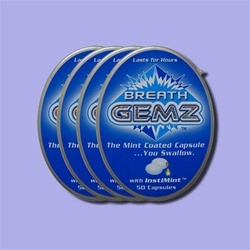 BreathGemz are new breath fresheners that give longer-lasting results than regular breath mints. Intensive research performed by scientists at BreathGemz has resulted in the creation of a breath freshener that attacks bad breath not only from inside the mouth but also from the stomach. Since BreathGemz are all natural, consumers can feel confident about their health every time they use it. BreathGemz work through a brilliant yet simple mechanism. Each capsule is coated with the company's patented InstiMint, which immediately freshens the breath of users. After this initial freshening stage is when normal breath mints quit, but BreathGemz capsules perform the biggest part of their work after being swallowed. The powerful combination of sunflower oil and parsley oil takes care of bad breath from within the body. Even the worst breath offenders, such as onion and garlic, are easily eliminated by this double approach. The BreathGemz manufacturing facility is GMP-certified, ensuring that these breath fresheners meet the highest purity standards in the industry. Batches are individually inspected by quality control technicians so users are consistently served with truly superb breath-freshening power. Above all, BreathGemz are the most comprehensive solution to halitosis on the market. BreathGems developed this product with an understanding of the importance of good breath for top performance at home and at work. Recognizing that good breath makes for pleasant companionship, the company aimed to develop a longer-lasting breath freshener for people who suffer from bad breath due to smoking, spicy foods or other reasons. After years of focused research and testing, BreathGemz were born. At BreathGemz, the goal in development and manufacturing has always been to create a product that lets people live full lives without making sacrifices to maintain fresh breath. While dental hygiene is essential for everyone, avoidance of favorite foods and activities shouldn't be necessary for avoiding halitosis. Since BreathGemz has been on the market, users don't have to reduce their quality of life because of problems with bad breath. People who enjoy frequent social occasions and rich meals will benefit greatly from BreathGemz. With the addition of these breath fresheners to a daily regimen, anybody can enjoy fresh breath that's consistent instead of fleeting. BreathGemz succeeded in their goal of making a breath freshener that takes care of bad breath right away and keeps working long afterwards. With regular use of BreathGemz Breath Mints, garlic breath and smoker's breath are both problems of the past. During long outings, BreathGemz can be taken after a spicy meal, a smoke or any time for extended relief from off-putting breath. This is a huge improvement over the breath mints of the past, which provided only temporary results at best. The effects of BreathGemz are the product of years of research into the science of bad breath. This is the cutting edge of breath-freshening technology. About the author: Dr. Anthony Dailley is a practicing dentist that specializes in halitosis treatment. He has been practicing since 1981 and graduated from San Francisco State University with a degree in Cell & Molecular Biology, and obtained his dental degree from the Pacific School of Dentistry. Dr. Dailley founded the Center for Breath Treatment in the San Francisco Bay Area and conducts research on curing halitosis. Dr. Dailley has also been a founder in a biotech company called NovaBay Pharmaceuticals and on their board of directors from 1997 -2014. I'm reading: Breath Gemz Product ReviewTweet this! I've read from a dental website about bad breath. Dentists sometimes work hand in hand with a gastroenterologist because the cause of the malodorous breath comes from the internal digestive system.